Best Video Performance Space will screen the legendary postwar thriller The Third Man on Wednesday, Jan. 15. The movie starts at 8 PM and admission is $5. We will screen the film from a high definition Blu-Ray disc on our 120-inch projection screen. 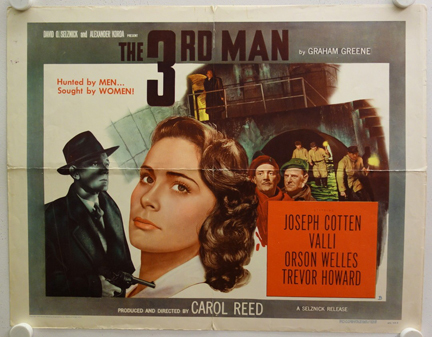 The Third Man, which stars Orson Welles and Joseph Cotten, was directed by Carol Reed from a script by Graham Greene. The movie has a 100% score on Rotten Tomatoes. The haunting music of a zither, the ring of Vienna’s cobbled streets and a ghostly Graham Greene story, about a man-hunt in that seamy capital flow smoothly and beautifully together into one piece of top screen artifice in Carol Reed’s most recent (and most touted) mystery-thriller-romance, The Third Man. Trailing Continental glories and faint echoes of that zither’s weird refrains, this extraordinarily fascinating picture began a run at the Victoria yesterday. But we feel we are bound to inform you that our key word is “artifice” in that thoroughly enthusiastic introductory paragraph. For the simple fact is that The Third Man, for all the awesome hoopla it has received, is essentially a first-rate contrivance in the way of melodrama—and that’s all. It isn’t a penetrating study of any European problem of the day (except that it skirts around black-markets and the sinister anomalies of ‘zones’). It doesn’t present any ‘message.’ It hasn’t a point of view. It is just a bang-up melodrama, designed to excite and entertain. In the light of the buzz about it, this is something we feel you should know. Once it is understood clearly, there is no need for further asides. The Third Man is being presented through the support of Best Video member John McNamara, a strong supporter of the Performance Space programming. 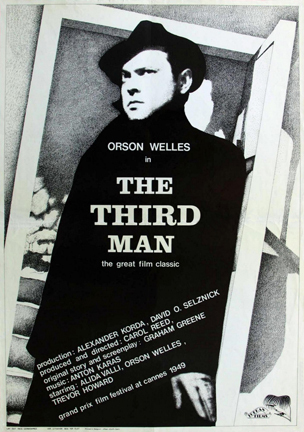 If forced to choose, McNamara says he would probably name The Third Man as his favorite movie of all time. High praise! Come down on Wednesday night to watch and see if the film becomes one of your favorites, too.